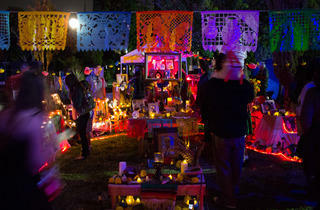 Photograph: Michael Juliano Day of the Dead 2013 at Hollywood Forever. Confront the Boogeyman at this year's installment of the spooky Griffith Park tradition. Stroll a scenic trail of thousands of intricately hand-carved jack-o-lanterns. Take a walk, with or without your furry sidekick, around the park for this Best Friends Animal Society's fundraiser. Rock your socks off with Die Antwoord, the Kids in the Hall, Amy Poehler and more at the Tenacious D-curated music and comedy fest. Meet robots and Mars rovers at the popular NASA open house above Pasadena. Pedal your way through DTLA, Chinatown, Westlake, Little Tokyo, the Arts District and Boyle Heights during the bike-friendly fest. 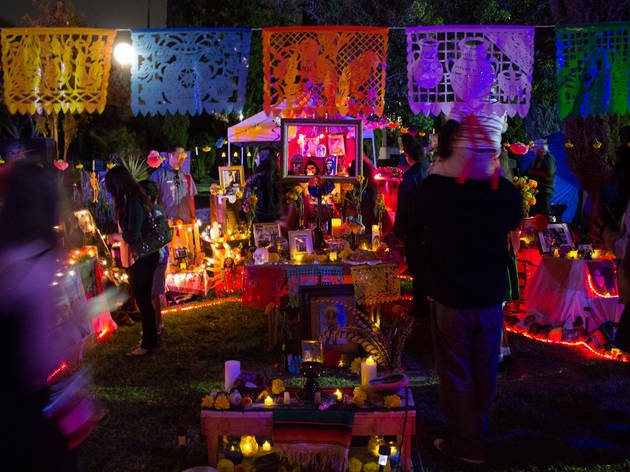 Find traditional Mexican music, food and altars dedicated to the dead at this annual celebration. Dance and drink your way through West Hollywood with thousands of other (sometimes scantily) costumed revelers. Find more things to do in our October 2015 events calendar along with our guide to Halloween in LA. Swap out pretzels for dumplings at this Oktoberfest alternative, where you can enjoy unlimited craft beer and choose from the best dumpling vendors in town. Celebrate the Harvest Moon Festival by clinking glasses at this swanky party featuring Asian-inspired libations from LA’s top mixologists. Stuff your face with donuts (and donut burgers!) at this gluttonous festival (Can’t make it? Read about all the donut shops we love.). Celebrate Oktoberfest at this annual meat-free event, boasting plenty of beer and vegan eateries. Twirl spaghetti and sip on world-class wine at Taste of Italy, with all proceeds going towards the Italian American Museum’s exhibitions and the Italian Hall. Enjoy the best food on the Eastside at this festival, where you’ll find Alimento, Jeni’s Ice Creams, Homestate and more repping this side of the city. See more of our favorite Oktoberfest events. Listen to Gustavo Dudamel conduct the LA Philharmonic through two complete cycles of Beethoven’s nine famous symphonies. Strap in as LA’s experimental opera company presents a new opera that takes place in 24 real, moving cars on LA streets. See traditional dances from all over Mexico performed by Mexico City’s renowned folk dance company. Snag your timed tickets starting today for the sure-to-be-popular installation opening November 1. Watch contemporary music ensemble will perform a night of new commissioned works by today’s cutting edge composers. See Melville’s classic adventure novel adapted for opera—it’s not a far stretch with all that drama. We’re teaming up with LA’s newest rooftop film series to present three films in October, and this tinseltown classic is our first pick. We chose another one of our favorite LA films, 1974 noir classic Chinatown, to be screened al fresco at Rooftop Film Club this Sunday eve. See LA transplant Garrett Borns play his eclectic blend of folk, glam and electric rock at the Cemetery. Catch the Ed Helms-helmed banjo-pickin’ bluegrass festival—back for its fifth year—during this intimate, one-night engagement. Hear tracks from Vile’s great new album, b’lieve i’m goin down, in addition to (we hope) some oldies but goodies. Listen to this Vancouver singer-songwriter croon piano ballads at the Fonda. Find more shows in our October 2015 concert calendar. See LA’s historic theater turn into a gymnasium for this bloody good time. Attend a new incarnation of the Tony Award-winning musical. Watch this world premiere with Broadway star Alison Luff and former American Idol star Constantine Maroulis.